Within the tarot, many writers see integration - the balancing of different aspects of self and/or the alchemical marriage - in pretty much every card of the Majors, if not the whole deck. But what of Lenormand? Clearly, in the Lenormand system there aren't loads of esoteric connections and so forth. Nor are there lots of different people and symbols on the cards to become integrated with one another, like on the Lovers, the Devil, or even with the pillars of the High Priestess, the Hierophant, Justice and the Moon. However, integration is still a fundamental need for many people in our modern, fragmented world. 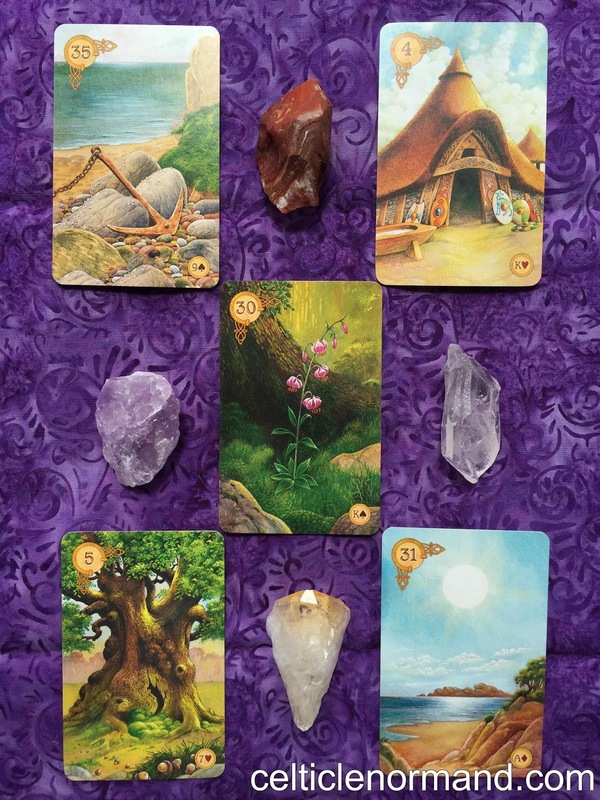 Any yet, I love using Lenormand cards for spell work, and that can often be about having to integrate different aspects of life and self. So, what to do? 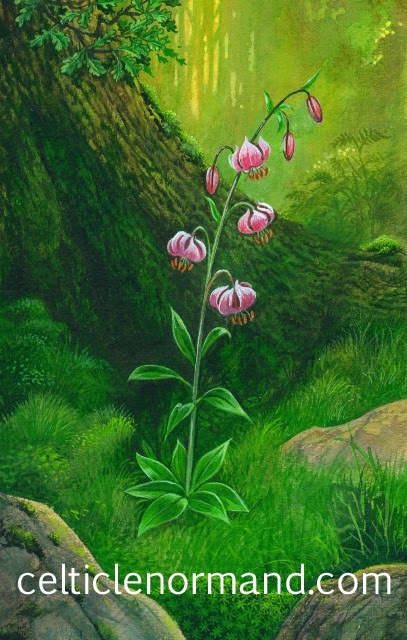 For me, the answer is the Lily card. Keywords here include purity and sexuality, innocence and maturity. It is a card of finding harmonious balance. 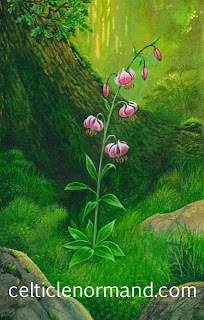 You can think about what elements of your life you want to balance at this time, and place the corresponding cards around the Lily card. For instance, the layout to the right is to integrate work life (Anchor) and family life (House), well-being (Tree) and energy (Sun). Of course, you can pick whatever cards feel most relevant to you at this time, whatever you want to integrate. A beautiful part of Lenormand spells is that they can always be read several ways. Here, I also see a message that stabilising my energy will bring me healing of family troubles. That's something else I could well do with, both at a physical and emotional level. At a physical level, my toddler has done me an injury, and I need to be careful about how I interact with him while I heal. At an emotional level, my partner and I have a big change on the horizon, which while joyful could also be a bit destabilising. Why not come and find us on Facebook, too? Reading: Will Trump leave office in 2018?